Climatic changes and fluctuations in water flows and resulting changes in water temperature have a dramatic effect on insect hatches and fish feeding patterns. As a result, a thermometer can mean the difference between catching fish or catching nothing at all. 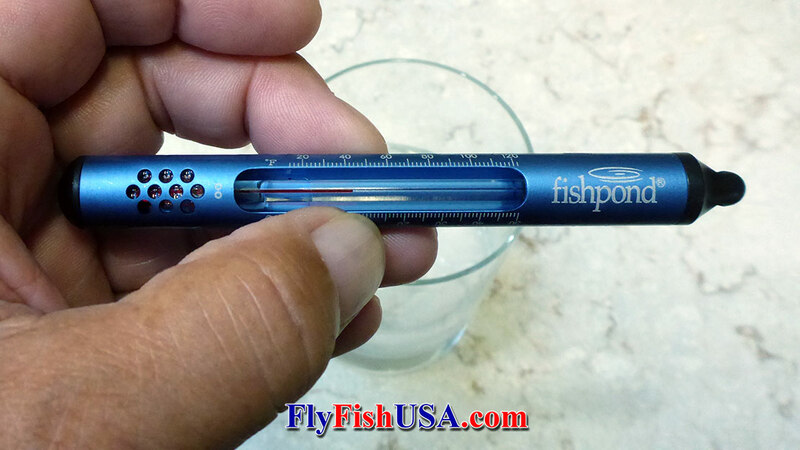 This laboratory-grade thermometer provides accurate water temperature readings under a variety of salt and freshwater fishing conditions. Measures water temperatures from 20 to 120 degrees F. Functional & cute. Warmer water contains less oxygen than colder water. As temperature rises and dissolved oxygen decreases, fish begin to experience stress. Conversely, if water temperatures drop below certain levels fish metabolism slows to the point that certain species of fish become nearly catatonic, and will even enter a state of near hibernation. Every kind of fish has an upper and lower temperature that it can endure, a a temperature range where it thrives best. If temperatures change gradually there is less effect than if there are sudden rises or drops. A thermometer can help an angler select between certain fishing methods, and can help find places in lakes or streams that have optimal temperatures for the fish you are seeking. Temperatures in Lakes and streams can be influenced by springs or tributaries. Oceans can have currents that run side by side and have vastly different temperatures.